Americana is one of the most contentious and open to individual interpretation labels attached to music in the second decade of the twenty-first century. However if you can squeeze another stab at personifying the term look no further than Robert Ellis. Too country for rock and too rock for country fits the bill neatly, as does a left field approach to making music. Throw in a stellar band and a rack of songs bulging with imaginative lyrics and you start to build a picture of an artist at the cutting edge of progressive roots music. Amongst an array of dates forming his latest tour to the UK, the eclectic and fiercely independent High and Lonesome Festival in Leeds awarded Robert the headline slot in the Left Bank Saturday evening presentation of this burgeoning event. Together with a three piece band hailed as the Perfect Strangers, Robert set about showing why he is such a respected artist and proved a fitting finale to a successful festival first day. Like any multi-site event, choices have to be made from a personal angle which bands to see, but the organisers made it a fairly easy decision here when they billed Robert Ellis, Applewood Road and The Leisure Society as the line up in the associate festival venue of the Left Bank. So after an afternoon soaking up a variety of artists in the event’s main site – the legendary Brudenell Social Club – it was the short walk to the salubrious confines of a decommissioned church in the heart of a gritty Leeds inner city suburb. Applewood Road is a side project for three talented performers spanning oceans in their residency and homeland. Together the trio of Amy Speace, Amber Rubarth and Emily Baker announced their arrival as a recording entity with a delightful self-titled album earlier this year. A handful of UK visits have promoted the record and it was a privilege to finally catch one of their shows in a venue built for the angelic voice. The trio responded with a stunning reproduction of a fair proportion of the record alongside a mesmeric cover of ‘Losing My Religion’ and a tribute to that other fabled ‘trio’ – Dolly, Linda and Emmylou – by following in their footsteps with another version of the much loved Jean Ritchie song ‘My Dear Companion’. While collaboration is a strong theme for Applewood Road, Emily Barker came across as the most diverse contributor adding percussion, banjo and harmonica to a sound sparse enough to let the songs flourish and prosper. Vocally the trio share a common bond with the three voices frequently melting into an eternal harmonious pool. From a song perspective, all the chosen pieces for this thirty-five minute set ached with sheer beauty, and an arm twist would probably elevate ‘Lovin’ Eyes’ to the first among equals. Sandwiched between the predominately stateside origin of Robert Ellis and Applewood Road was an established English folk pop trio in The Leisure Society, appearing this evening in a slimmed down trio format. Essentially the band landed in a halfway slot between the acoustic charm of Applewood Road and the full on electrification of Robert’s band. Although on this occasion, the fiddle, acoustic guitar and keyboards lent more in the direction of the act they followed rather than one we had yet to witness. A link between all three artists scheduled for the Left Bank was a debut appearance in my presence. Whilst The Leisure Society were always going to be hard pushed to make a greater impact here than their fellow artists, the songs shared and the accompanying style possessed much merit with the forty minute set upholding the spirit of thriving independent song writing with an alternative spin – the true ethos of the High and Lonesome Festival. Clad in a bizarre suit and a matching persona frequently dipping into surreal territory, Robert Ellis wasted little time in creating an appealing first impression and followed this up with a raft of serious songs from his two highly innovative album releases. The surroundings were to prove no inhibition for the band led by ace lead guitarist Kelly Doyle. Robert himself fluctuated between guitar and keyboards, forever proving a compelling front man whether majoring on the irreverent or the informed. Learning a lot about an artist is always a good sign of a successful gig and Robert left plenty to ponder with the theme of songs such as ‘Elephant’, ‘Houston’, ‘Singalong’ and ‘Couples Skate’. The hour on stage vanished too quickly, but fully grasping the aura around Robert Ellis was accomplished by the time the curfew won the day. While no report can be made on the Saturday evening Brudenell bands, the afternoon session in the venue’s two music rooms threw up an interesting mix of artists covering a multitude of styles. Solo, band, electric, acoustic, guitar and banjo were just some of the assorted offerings from an event kicking off at 1:00 PM and lasting into a second day with a trimmed down Sunday selection. Each artist had just thirty minutes to grab the attention of a floating audience with four probably doing enough to warrant reflection four days later. Leading this pack is an artist known from many listings and appearing in the main room in a full band format. Charlotte Carpenter shared an appetising style of appealing indie-rock reflecting a variety of moods at contrasting paces. She meant business with the rack of electric guitars and a fellow picker who delved into slide lap playing for one of the set’s slower songs. While her style was quintessentially English, two further artists to impress had the roots firmly in the US. 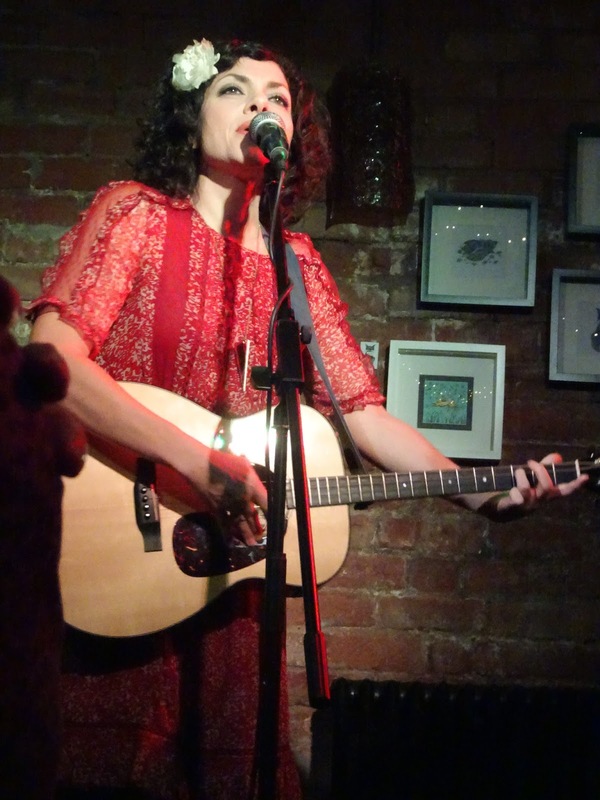 California folk songstress Jenny O came across as a curious performer, yet there was an endearing charm to the way she presented her songs and being engulfed in her captivating performance was not a bad way to spend half an hour. As previously indicated, this was the time allotted to all the afternoon performances and banjoist Nathan Boules used his moment in the spotlight to extract some smart tunes from his timeless art form. Maybe there is a time shelf limit to a deluge of banjo instrumentals but half an hour kept the positivity in credit. Earlier in the afternoon, Swedish guitarist Albert AF Ekenstam had impressed with a selection of atmospheric moody tunes, hinting at a slice of Scandinavian noir. Fair play to the organisers with getting the acts on swiftly, with a constant flow of music being on offer to the early birds prepared for a short amble from one room in the venue to another. Previous set ups for the High and Lonesome Festival included a similar style of line up, but in a couple of city centre venues. This year’s did have a more settled base with the bulk of the action taking place in the Brudenell across the weekend. However as soon as the two key festival protagonists from a personal angle formed the bulk of the schedule in the aptly named Left Bank, the potential event highlight was narrowed down to a binary choice. Applewood Road and Robert Ellis were peerless exponents of Americana/roots music at varying ends of a vast spectrum, but both brought something special to this event. While Robert Ellis had the privilege of the introduction and a highly charged entry into the 2016 festival set pantheon, it is perhaps Applewood Road and their divine rendition of the succinct three part harmony which warrants the final word. A couple of years ago Jason Ringenberg paid tribute to those in the teaching profession during one of his UK gigs. This evening Sara Watkins trumped that by dedicating ‘Tenderhearted’ to teachers, social workers and volunteers before delivering a song epitomising the way she uses her talent to make meaningful music. This extraordinary ability to mix vocal skill, song writing expertise and multi-instrumental virtuosity is reaping rewards in this phase of her career as a flourishing solo artist. Solo was the word tonight as any misguided assumption that she would tour the new album in some kind of band format was laid to rest as she pulled off the one woman show with a stunning performance. You only had to hear the lead track from the new album to grasp that this was a breakout release. Breakthrough wouldn’t be the right word for a highly respected artist at the top of her game for a long time whether as a fledgling member of iconic roots revival pioneers Nickel Creek, part of the Watkins Family Hour or just plain Sara Watkins – the solo performer. Yet there was something radically effective about the spirit of ‘Move Me’, even in tonight’s playing which lacked the full force of the band version while never falling short on sentiment. Sara herself described the album as the result of personal transition and she has to be congratulated on making YOUNG IN ALL THE WRONG WAYS one of my favourite albums of 2016. The key to the success of this Oxford show, once again brought to us by the popular Empty Rooms Promo, was the way Sara utilised the diversity of her four chosen instruments. The trademark fabulous fiddle playing was on full show with a variety of bow and picking styles utilising every inch of the majestic wand. Early in the set she treated the audience to the Swedish inspired fiddle tune ‘Jefferson’ which appeared on her debut solo album and instantly wowed a well-attended seated gathering. While an even use of acoustic guitar and ukulele spread the effect of the accompanying sound, it was the pure nostalgia she extracted from her Gibson 140 which rivalled the fiddle for the show’s stand out musical moments. Sara’s eighty minutes in the spotlight saw her feature material from a range of sources and time period. Harking back to her Nickel Creek days, the crowd were invited to join in on the whistling part of ‘Anthony’. In recognising some of the duo work she has done with brother Sean, and a love for Jackson Browne, a version of ‘Your Bright Baby Blues’ was supremely delivered and thoroughly enjoyed. This was one of three covers chosen which hasn’t appeared on a Sara album alongside ‘Young Man in America’, a tribute to her friend and peer Anais Mitchell, and a version of Buddy Holly’s ‘Early in the Morning’ in the encore slot. At this point she did refer to ailments making her voice a little ragged, but any effect was barely noticed in a show which continually sparkled right from the opening track ‘Too Much’. The new album was heartily featured throughout with Sara executing the vocal range in the title track impressively. Instant popular songs from the record were at the core of the set list including ‘One Last Time’, ‘Say So’ and ‘Like New Year’s Day’. Unfortunately ‘The Truth Won’t Set Us Free’ didn’t make the cut, but maybe next time. From her eponymous debut solo album we were treated to a sublime version of the John Hartford song ‘Long Hot Summer Days’, complete with fine fiddle and a rousing chorus, while from its subsequent follow up record ‘You and Me’ cemented itself as one of the strongest songs in Sara’s back catalogue. Sara herself was in appreciative, spritely and humble spirit throughout the show. Eager to connect with the audience, she shared some insight and inspiration including her early fiddling days in Southern California and the recent touring association with Aoife O’Donovan and Sarah Jarosz as part of the’ I’m With Her’ project. During those shows which toured the UK, we had a glimpse of Sara’s talent in collaboration, but it was a welcome experience to enjoy the full repertoire in the solo spotlight. The support for the evening came from Isle of Wight based singer-songwriter Claydon Connor. With a style heavily influenced by the individual country and folk performer, he possessed all the attributes of an artist capable of carving out a significant career on the UK circuit. His performance was in synch with the sentiment of the evening and leaving a favourable impression is one of the core objectives of opening for a more established artist. Without doubt more will be heard of Claydon in the future and opportunities like this evening will likely to continue as time progresses. Sara summed up this UK tour as an opportunity to re-connect with the stripped down basics of the new album, a record that she shared with many others during its evolution. While it would be useful to experience the songs in the band sphere, this method of showcase worked extremely well and the innate talent was fully exposed in all its finesse. YOUNG IN ALL THE WRONG WAYS has been the year’s most refreshing record and the crux of Sara Watkins is that not only does she possess all the credentials, she uses them in the right way. A true talent of our time and the architect of a memorable show this evening. 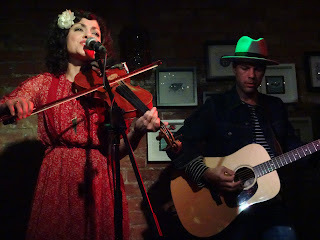 Midway through this gig, the penny dropped on what makes The Black Feathers one of the most precious duet harmony acts on the UK folk and acoustic circuit. Apart from the impeccable timing, a sweet sound surrounded by a dark wrapping and dovetailed voices, it is the way they interject the golden moment of anticipated silence so effectively into many of their songs. The dramatic effect leaves the listener hooked on where the piece is heading and is borne out of an inherent talent to harness the beauty of the duet. It took a while for this Gloucestershire based duo to hook up with the Kitchen Garden Café and now sealed, it is a union made for the idealistic music listener. To comment that their debut performance at Birmingham’s premier listening venue was a resounding success is a dramatic understatement and surely a trend set for subsequent visits. Right from the irony of opening track ‘Goodbye Tomorrow’ through to an inclusive rousing unplugged cover of ‘Big Yellow Taxi’ to bring down the curtain, Sian Chandler and Ray Hughes consistently showed the finesse of their craft. There is no element of doubt that their multiple American excursions are playing a significant role in forming The Black Feathers. There are definite southern sensibilities creeping into their sound as well as a certain bias towards the sad song genre. Long may this influence remain as the whole aura around The Black Feathers soaks up the mystique of a sound attracted to the male-female harmony duet orchestrated by a single acoustic guitar. SOAKED TO THE BONE, their debut full length release, hit the market earlier this year and has refused to be budged from playlists by likeminded peer acts. This evening the album was fondly delved into by Sian and Ray with ‘Arclight’ soaring above the rest with its atmospheric majesty, pushed to the limit by ‘Down to the River’, ‘Homesick’ and ‘All For You’. On this record the duo braved the wrath of bandwagon jumping by covering a version of the Dylan-Adele populist piece ‘Make You Feel My Love’ and pulled it off with spine tingling excellence. The only food for thought is that maybe future covers should be in the re-interpretative mould that they dealt with the classic ‘Spirit in the Sky’. Lofty praise for the work of The Black Feathers though is stating that the only difference between the covers and the originals is a sense of familiarity. On the topic of originals, we were served a couple of newbies in their brace of gig sets, one hot off the notepad with the title recalled from a significant memorable chorus ‘The Ghost Has Eaten Well’. The other fresh song had its origins in a Pennsylvania log cabin, with ‘Holy Water’ leaking out as one of the most personal songs to date from the duo’s brief repertoire. The good news is that both sounded great and re-assurance that one day SOAKED TO THE BONE will have a worthy follow up. Before we leave the track analysis, a quick word on two songs picked from their initial EP including the sole love composition ‘You Will Be Mine’ and the lyrically smart ‘Open Book’. Prior to The Black Feathers entertaining a respectable Kitchen Garden Café debut turnout, Birmingham based band (in a slimmed down trio format for the show) The Lost Notes opened proceedings with a similar acoustic sound and thriving mixture of duets, three part harmonies, memorable guitar pieces and a batch of songs that held your attention. Mutual respect was interchanged between both acts and recognition that grass roots music requires supportive camaraderie. The grass roots may not be the long term home of The Black Feathers when judgement day arrives and the re-alignment of music justice sieves out the crap. Until then the enlightened few will revel in an act that makes music the right way and does it rather well. The grass roots may not be such a bad place when unfiltered music is there to be enjoyed. It’s been a resurgent year for the music of Katy Rose Bennett. Her long awaited new album emerged in April and had a successful launch show at the Kitchen Garden Café in her hometown of Birmingham. To complete the year she re-united her band and headed into the rural confines of Worcestershire to play a headline gig in the emerging musical hotbed of Bewdley. Seriously though, the guys behind the Music in Hall monthly shows have done a grand job bringing a series of international and British artists to a town not particularly noted for its touring scene; all this under the Americana/country/folk banner promoting quality original music itching to get more deserved coverage. In line with their usual schedule, a couple of support artists with a local connection played a pair of sets leading up to the 9:30 slot when the headliner appears. Unfortunately only one of these acts was seen, but it wasn’t too difficult to latch onto the positive vibes radiating from the three-piece combo Son of John. Not to be confused with the American band of a similar style Sons of Bill, this trio had strong Bewdley roots and have hit on a sultry evocative style of folk-Americana, tinted with an appealing dark undercurrent. Their set of original material certainly caught the ear with a guitar trinity of bass, electric twang and driving acoustic combining well to form an atmospheric sound. They have a new album titled AUTUMN’S HYMN out and it would interest music fans enthused by a deep vocal style amidst a swathe of emotive strings. perspective with its near entire exposure in a live format. This evening the four piece band consisted of Katy (guitar, vocals), Sam Frankie Fox (backing vocals), Lydia Glanville (percussion) and Laura Mattison (violin). The band format was utilised well during the set with Katy reverting to duo and solo status for a couple of selective moments. Throughout the show Katy shared many of the songs’ origins and held the non-musical parts with a warm assuredness. We even had the benefit of two brand new songs hot off the writing notebook with both ‘Box in the Attic’ and ‘Moon’ standing out in their own spheres. The first was almost a poetic piece based on family recollections lifted from three old photos, while the second was a more melodic offering in the style of old time country, jazz, blues. On three occasions Katy stepped back in time to offer songs from her previous albums which were issued under her initial recording name KTB. The best of these on the night was ‘Bluebird’, the title track of an old release and beautifully sung with Sam. From the new record, ‘Soul in the Soil’ was the track to raise its profile the most from album listening especially with Katy filling in details of the subject content. ‘My Friend’ seems set as the rousing show closer, although it was joined enthusiastically in the audience participation category by ‘We’ll Keep Trying’. On top of these, initial favourites from the album including ‘Jack and Ivy’, ‘Counting Kettles’ and ‘Cold November Day’ continue to show Katy at her song writing best; a great exponent of kitchen sink contemporary folk. Katy Rose Bennett rose to the challenge of this extended headline show in grand style and another impressive Bewdley turnout justified the smart decision to add her to the growing list of quality artists to play the venue in this context; incidentally one which contains her brothers, Joe and Robin from The Dreaming Spires. Katy’s prominent return to the local music scene, mainly in the guise of the new album, has been one of the successes of the year and fingers crossed for a similar upwards trajectory in forthcoming years. 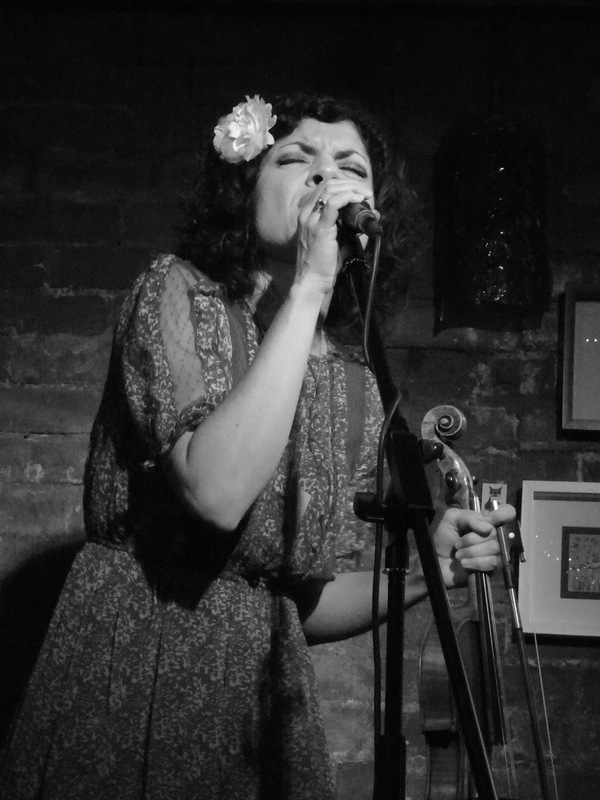 For one night only, Birmingham’s premier listening venue transformed itself into the Kitchen Garden Cantina as Carrie Rodriguez finally brought her sublime vocals, classically trained fiddle playing and sumptuous songs to the city. Previously she had appeared in neighbouring Wolverhampton in the days before she left the Chip Taylor protégé tag. Now fully blossomed into a multi-dimensional performer, Carrie tours with husband Luke Jacobs and together they are entering a rich vein of experimental form designed to give you the rounded ethnic diversity of Texas music. The couple, now a family trio, have made Carrie’s hometown city Austin their home and it is her extended Hispanic roots which have fully inspired her latest record. Thus the wondrous cross border sound exploring the golden age of Mexican music filled the air at the Kitchen Garden this evening with no finer vocalist than Carrie to throw in a mix of Spanish, English and that hybrid language Spanglish. Several songs in this bi-lingual celebration were lifted off the album LOLA , released to widespread acclaim and fulfilling a lifelong dream for Carrie to explore her heritage in song. There is something exotic and aurally pleasing listening to an array of songs with such titles as ‘Lana Estacado’, ‘Frio en al alma’ and ‘Que Manera de Perder’ in an intimate setting. To highlight the diversity, its seminal track ‘I Dreamt I Was Lola Beltran’ carries the soul of the record and another special moment was the bi-lingual duet with Luke. On a project that Carrie expressed much pride in, ‘The West Side’ stood out this evening aided by its backdrop story explaining the hidden issues growing up across the Austin divide such as lunch ticket names. While on the subject of the Texas state capital, and before we reflect fondly on the older material Carrie played, ‘Austin’ was one of a number of songs written and played by Luke during the show – all to be found on his debut solo album VELVET AFTER FEEL. This had its origin in a tragedy at the city’s South By South West festival a few years ago and like so many of his songs, they were adorned in the classic singer-songwriter style synonymous with Texas. Ironically Luke doesn’t hail from the Lone Star State, but thousands of miles north in Minnesota. To continue the geographical connection, one of that state’s attractions inspired Carrie to write and record ‘Lake Harriet’, personally considered one her finest songs in a catalogue now stretching back ten years. The superb live Music Fog video of this song has maintained its prominence long after the initial release. These older songs were no doubt highly anticipated by many long term Carrie fans in the audience and she rewarded their devotion which such gems as ‘Seven Angels on a Bicycle’, ‘She Ain’t Me’ and the fiery fiddle closer ‘Never Gonna Be Your Bride’. Continuing the instrumental theme of the evening and alongside Carrie’s majestic mastering of the violin – so long her trademark skill – Luke’s delectable lap steel gave the sound a sublime coating. These instrumental interludes were shared with standard guitar playing ensuring each song was delivered with perfect accompaniment. Alongside the special tribute to a Minnesota lake mentioned previously, Carrie and Luke frequently delved into their 2013 album GIVE ME ALL YOU GOT with the edgy ‘Devil in Mind’ just shading pre-encore selection ‘I Cry For Love’ in the appreciation sphere. On an evening where Carrie didn’t hold back on her joy and fascination of playing this intimate venue for the first time, she was also humbled by the support given to her in the making process of LOLA by folks in the UK. With this being the first date of a much anticipated countrywide tour, golden opportunities are open for many fans, old and new, to be seduced by the sheer delight of seeing Carrie Rodriguez play music and sing songs. More temporary cantinas are likely to spring up before she and Luke head back home to Austin. Thanks to Andy D. for the photos. Louisville Kentucky; Columbia Maryland and London UK: three reasons why Brandi Carlile is the undisputed premier artist of 2016 in these quarters. Just over twelve months ago the Grammy nominated album THE FIREWATCHER’S DAUGHTER featured highly in the annual favourite release list and if this was rolled out as a two year celebration it would be without equals. It has more mileage than a lunar expedition and has really had its credentials exposed within the live arena. The last of these three locations to see Brandi in concert was her triumphant return to Britain, although there is unfinished business around the provinces. On stage at Shepherd’s Bush Empire, and subsequently on social media, she promised to make these transatlantic shows a more frequent occurrence, with the obvious persuasive stance from many of her UK fans to venture outside of the capital. However these suggestions are probably left for another day, amidst the joy of seeing Brandi and the twins actually play a supreme show on British soil. Previous shows in the capital across Brandi’s ten plus years in the starlight since her 2005 debut album were constantly referred to as she felt humbled by the growth of the venues from The Borderline to this evening’s more populous location. Although it was the pin drop show at the Union Chapel which fired her up tonight and led her to try to re-create two totally unplugged moments. It will have to be left to others in the venue to comment on the effectiveness of this choice of song delivery, but four paces from the front of the stage left little room for complaint. All five band members came to the front of the stage to unleash an unplugged version of ‘What Can I Say’, while a breath taking first encore song saw Brandi, Tim and Phil appear on the right side balcony to deliver ‘Beginning to Feel the Years’. The evening’s pivotal points were far from consigned to these golden moments as Brandi explored the full range of her repertoire from the gospel tinged ‘That Wasn’t Me’ to the raucous ‘Mainstream Kid’, a defining sound switch exemplifying the eclectic appeal of the latest record. Just taking a break from Brandi fever for a moment and a welcome addition to the bill for these European shows was Angaleena Presley. If Brandi dips her toe into country music, then Angaleena is totally immersed into it. Afforded a decent forty-five minute opening slot, it was a case of the new, old and older in her song arsenal. Maybe the musical accompaniment was stripped to a bare minimum and the audience was not a country music breathing one, but Angaleena did a grand job introducing, explaining and ultimately singing a bunch of songs with strong lyrical substance. From her acclaimed debut album, ‘American Middle Class’, ‘Dry County Blues’ and ‘Knocked Up’ focussed on significant social comment. Several new songs got an early airing as well with the expected follow up album release in the first half of 2017. First impressions were good, usual sassy comment and packed with lyrics that befit any country song. Perhaps a reminder of Angaleena’s real strength in penning a melody was the oldest song of the set in ‘Lemon Drop’ from the Pistol Annies first album. Angaleena was keen to add a country spice to the evening and one abiding memory of her set was that Brandi’s fans need to get more into Loretta Lynn, Waylon Jennings and Townes Van Zandt. These have certainly inspired Brandi in spirit, if not in authentic country sound. From the summer Stateside shows, Brandi dropped the country covers of ‘Folsom Prison Blues’ and ‘Peaceful Easy Feelin’, while obviously keeping the more mainstream rock choices of Led Zeppelin’s ‘Going to California’ and the instantly recognisable ‘The Chain’. The latter played out as the final song with the full band re-united on stage for the finale. Another country style song missing from the summer was the joyous ditty ‘Keep Your Heart Young’, but there were plenty of gems from across her five album back catalogue to thrill the dedicated and the casual. From the latest record, the powerful trio of ‘Things I Regret’, ‘Wherever is Your Heart’ and ‘The Eye’ sparkled in their glory. Long term Brandi companions the twins Phil and Tim Hanseroth join her for the majestic three-part harmony on the latter. When paying respect to her friends, she stated they are a band with no lead singer, but this does not do justice to her wonderfully cracked vocals that pour out so much feeling, passion and emotion. While on the emotive subject, Brandi introduced the ode to her daughter Evangeline which has recently been written. ‘Mother’ featured prominently on her summer US shows and it went down as well with her committed fans this side of the pond as those devoted from coast to coast in America. Brandi was in her usual ‘heart on sleeve’ mode and the love shown in the packed venue was totally unconditional. This is repaid with a stirring live performance adept at rocking out with the best on songs like ‘Pride and Joy’ and giving many their required treat with a sublime performance of her most prominent song ‘The Story’. In fact the ninety plus minutes the band was on stage rocked in a multitude of magnificent ways. Right from the highly pleasing opener ‘Again Today’ through a couple of classics from the BEAR CREEK album in ‘Hard Way Home’ and ‘Raise Hell’ and to the final song recalled from the set list memory ‘Dreams’. Without doubt Brandi was not shy on projecting the fact that she was living her own dream and one that she intends to share with a willing audience for a long time to come. Eventually the book will close on THE FIREWATCHER’S DAUGHTER and 2016 will finally be anointed the gig year of Brandi Carlile. A new album is promised soon, along with the aforementioned London return. However pressure must be applied that our capital, and the south, should not be the limits of the UK horizon. Wonderful nights like this Shepherd’s Bush Empire concert deserve to be shared across a wider UK platform. Over to you Brandi!